Nematode Neurons: Anatomical Methods in Caenorhabditis elegans. Investigantions of Learning and Memory in C. elegans. Neuronal Specification and Differentiation. Sexual Behavior of the C. elegans Male. The Motor Circuit. Mechanosensation in C. Elegans. The Neurobiology of C. elegans assembles together a series of chapters describing the progress researchers have made toward solving some of the major problems in neurobiology with the use of this powerful model organism. 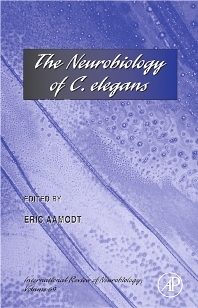 The first chapter is an introduction to the anatomy of the C. elegans nervous system. This chapter provides a useful introduction to this system and will help the reader who is less familiar with this system understand the chapters that follow. The next two chapters on learning, conditioning and memory and neuronal specification and differentiation, summarize the current state of the C. elegans field in these two major areas of neurobiology. The remaining chapters describe studies in C. elegans that have provided particularly exciting insights into neurobiology.